What is XMLNoteTree? 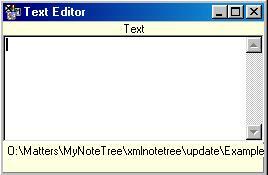 XMLNoteTree is a program for viewing and editing XML data files. Download XMLNoteTree Now View XMLNoteTree Features Current Version 0.9, Build date 26th February 2002. 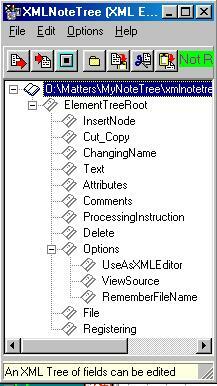 Use XMLNoteTree to maintain a tree of notes for quick lookup. Ideal for people who want their specific data available and easy to find. XMLNoteTree processes XML Files and saves its data in XML Files. XML NoteTree uses XML version = "1.0" and encoding="ISO-8859-1" only. It is not full Unicode compliant but instead is 8 bit character set only. Use XMLNoteTree to view edit and repair e-commerce data. Data transferred between applications can sometimes not be right and is therefor not accepted by the applications. XMLNoteTree allows the experienced applications programmer an easy way to view and edit this data. Use XMLNoteTree to create an XML record. This is useful for testing applications when developing e-commerce applications. Many applications now save their internal settings as an XML file.The experienced user can use XMLNoteTree to view and edit the internal settings of those applications. How does XML work? XML is a tree datastructure which when serialised becomes a single string of charactors and when parsed provides the tree datastructure again. Each node in an XML tree is an element and elements can have other elements, text, attributes, comments and processing instructions under them. XMLNoteTree is a set of windows. The Main Windows is where elements in the tree are selected, added and deleted. The top most element is the Document itself and it contains the name of the file that is presently being edited. Only one element may be beneath this document and only one element may be beneath the first element of the element tree. The first element can have text, processing instructions and attributes like all the other elements. Selecting an element in the tree displays the text at that element in the Text Editor. Right mouse click on a selected tree node brings up a menu for adding and deleting nodes from the tree. Alternatively use the menus under the Edit Main Menu option. Edit the text in the Text Editor to add and change the text at a particular node. The Options Menu has an option Use as XML Editor. 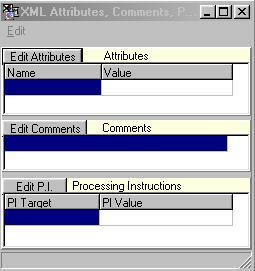 When this option is selected (ticked) a window that shows the attributes, comments and processing instructions at the selected nodes is displayed. When this is selected the View Source Menu option appears. Click the Edit Attributes button to add or edit Attribute valued pairs. Likewise click the Edit Comments and Edit P.I. to add or edit comments and processing instructions. Use the View Source menu option under Options to bring up a window with the source for the current Tree in it. Edit that source and save as a different file as you wish. I think the rest is self explanatory so give it a try. I welcome feedback and will make changes you ask for provided they are within the scope of this application. That scope is editing XML data files. Best regards Trevor Croll.